Meet our new guest blogger Lynne! Hi Everyone! My name is Lynne and I’m excited about sharing my recipes with others who are passionate about eating healthy, nutritious and delicious organic foods! Here’s a little about me and where my passion for produce originated. I had the blessing of growing up in New England where my family ate fresh, seasonal foods, including plenty of scrumptious fruits and veggies from my Grandmother’s garden. What I like most about Space Girl Organics is that they provide fresh, seasonal foods directly from the farm and deliver them to my doorstep. That reminds me of home. I couldn’t ask for better! This is one of my favorite dishes because it incorporates three rock star foods: quiona, spinach and butternut squash. 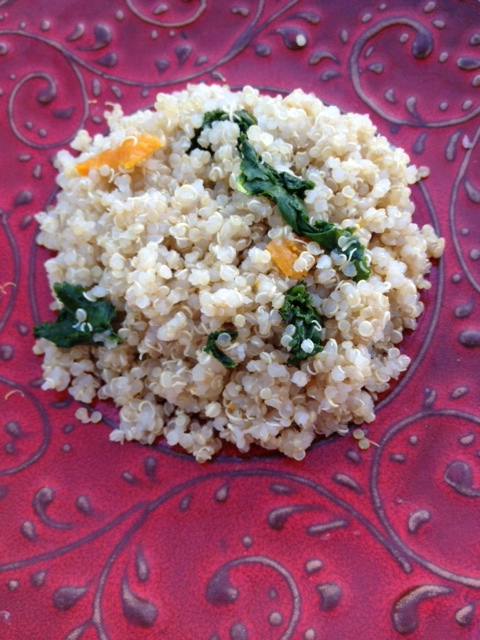 I call it simply: Quinoa with Garlicky Spinach and Roasted Butternut Squash. Feel free to substitute any of the vegetables, such as adding kale instead of spinach or roasted pumpkin rather than butternut squash. It’s just as delicious. This dish has the added bonus of being both gluten and wheat free. Heat oven to 375 degrees. Place butternut squash cut side down on a parchment lined or oiled baking sheet. Roast until the squash is soft and a knife can easily pierce the flesh, about 25 to 35 minutes. Remove from the oven and set it aside until cool enough to handle. While the squash is roasting, put the quinoa into a fine mesh strainer and rinse under cold water. Bring the 2 cups of water to boil in a medium saucepan and then add the quinoa and salt, if using. Bring back to a boil and then lower the heat to a rolling simmer. Cook covered until all of the water is absorbed, about 15 to 20 minutes. I add the salt during cooking because it permeates the quinoa for added flavor, but feel free to skip it if you prefer. You can adjust the seasoning after the dish is assembled. To prepare the spinach, heat the oil in a skillet and add the minced garlic. Let the garlic become cook for about one minute then add the spinach. Sautee until the leaves turn a dark green color and wilt, about 3 to 4 minutes. Set aside. When the quinoa has absorbed all the water, pour it into a large serving bowl. Take the butternut squash and remove the flesh. Dice it into bite-sized pieces and add to the quinoa. Finally, add the sautéed spinach and stir to combine. Taste and add salt and pepper as needed. Enjoy!